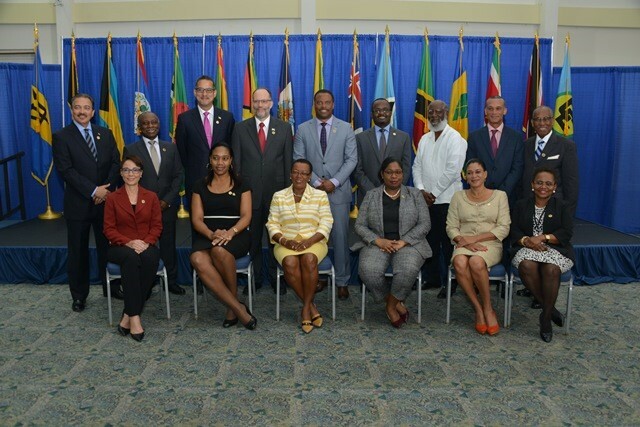 GEORGETOWN - Foreign Ministers of the Caribbean Community (CARICOM) gathered in Bridgetown, Barbados, at the Twentieth Meeting of the Council for Foreign and Community Relations (COFCOR) deliberated on the changes taking place in the international environment as well as in their wider regional environment and on their implications for the coordinated foreign policy positioning of their countries. They reiterated the importance they accord to maintenance of the rule of law, respect for human rights and democracy, as well as to the fundamental principles of non-intervention and non-interference in the internal affairs of states. These values and principles were viewed as being of paramount importance when addressing international situations of concern. The Foreign Ministers were united in their view that respect for these values and principles would prove valuable and pertinent in addressing concerns over the situation in Venezuela. Persuaded that the solution to the present situation had to be sought internally, supported by a mediated process, they were of the view that the deeply entrenched positions needed to be softened so that trust could be built on both sides in order to facilitate dialogue so that the people of Venezuela could peacefully overcome their crisis. Foreign Ministers decried the violence taking place and deplored the resulting loss of life and property. Photo: COFCOR Official photo (front row, from left) Senator the Hon. Kamina Johnson Smith, Minister of Foreign Affairs and Foreign Trade of Jamaica; Hon. Senator Francine Baron, Minister of Foreign Affairs and CARICOM Affairs of Dominica; Senator the Hon Maxine Mclean, Minister of Foreign Affairs of Barbados and Chair of COFCOR; Hon. Yldiz D Pollack-Beighle, Minister of Foreign Affairs of Suriname; Her Excellency Elma Gene Isaac, Ambassador to CARICOM and OECS representing Saint Lucia; Ms Sharon Haylock, Director-General, Ministry of Foreign Affairs and Immigration representing The Bahamas. (Back row, from left) - Hon. H. Charles Fernandez, Minister of Foreign Affairs and International Trade of Antigua and Barbuda; Hon. Carl Greenidge, Minister of Foreign Affairs of Guyana; Hon. Nicolas Skeete, Minister of Health, Social Security and International Business of Grenada; Ambassador Irwin LaRocque, CARICOM Secretary-General; The Hon. Mark Brantley, Minister of Foreign Affairs and Aviation of St Kitts and Nevis; His Excellency Peterson Noel, Ambassador to CARICOM representing Haiti; Hon. Wilfred Peter Elrington, Minister of Foreign Affairs and Attorney-General of Belize; Senator Dennis Moses, Minister of Foreign and CARICOM Affairs of Trinidad and Tobago; Minister of Foreign Affairs, Trade, Commerce and Regional Integration of St Vincent and the Grenadines.